Please contact us with your application requirements for an alternative or check out our list of Scale & Corrosion Inhibitors. 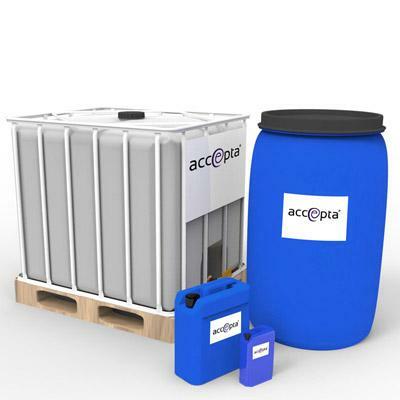 Accepta 0019 is a high performance all organic cooling water treatment formulated using advanced scale and corrosion inhibitors with additional dispersants for the treatment and protection of industrial re-circulating cooling water systems. Accepta 0019 is stable at elevated temperatures throughout a wide pH range (acid dosing is not required) and in the presence of oxidising disinfectants. This single treatment inhibits scale formation, corrosion and sedimentation fouling when the system is treated in accordance with our recommendations. Accepta 0019 is a very effective treatment for modern cooling water systems operating with high calcium and alkalinity levels and has been proved successful in a large number of differing cooling systems. High performance all organic scale and corrosion inhibitor with dispersants for industrial recirculating cooling water systems. Effective at Langelier Saturation Index up to +3.3. Allows elevated system concentration reducing running costs. Excellent scale inhibitor in severe scaling conditions. Accepta 0019 should be dosed proportional to the system make up to ensure a continuous reserve within the system water. The product can be dosed direct from the drum or pre-diluted in a dosing tank. Dosage levels will be dependent upon water quality, system conditions and operational factors. The correct level for your system will be advised by your technical consultant. A simple test method is available for on-site analysis.